A Martin Dreadnought made in Style 16 with a beautiful Rosewood body and high Gloss Top; the Martin D16RGT raises the bar for an affordable Martin guitar. Martin's famous 16-series strikes again! I am consistently surprised at how good these things sound. In countless shootouts with D-28s, the D16RGT holds it own every time! 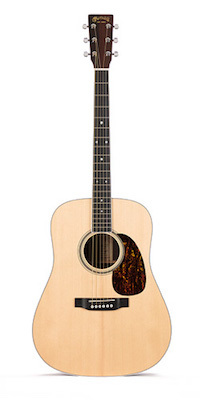 The Martin D-16RGT is a fine example of a Martin Dreadnought acoustic guitar, bringing classic looks and classic tone to modern guitar specifications. The solid East Indian rosewood back and sides complement the solid Sitka spruce top finished in a polished gloss. The D16RGT shines when used in the studio, delivering a tried-and-true prominent acoustic voice.